Astronauts are closer to being able to manufacture tools and parts on demand in the International Space Station after Made In Space‘s 3D printer passed its final NASA test and had its launch date moved forward to August. NASA is interested in having a 3D printer aboard the space station because it will give astronauts the ability to create custom parts exactly when they need them. For example, after a spacewalk turned dangerous last year when an astronaut’s suit began to fill with water, the crew modified their suits with makeshift snorkels made from velcro and plastic tubing. A 3D printer could also be used for more mundane jobs like printing extra bolts, springs and tools for science experiments. 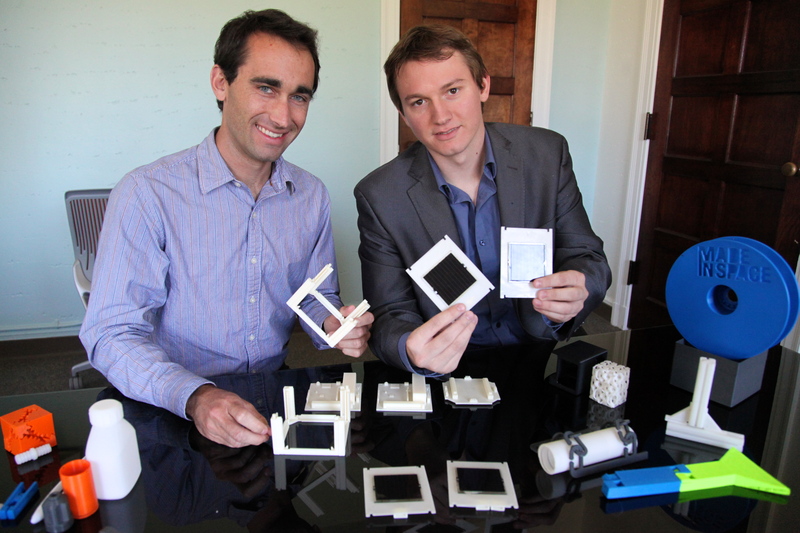 CTO Jason Dunn and CEO Aaron Kemmer show off a 3D printed CubeSat, plus other parts that could be made aboard the ISS. Photo by Signe Brewster. Its first task aboard the ISS will be to print 21 test parts, video of which will be sent back to Earth and analyzed. One Made In Space knows the printer works and the items it produces are useable, it will work on increasing its build volume and adding new printing materials. The printer will leave Earth aboard SpaceX’s fourth resupply mission to the ISS. It was originally slated to launch in November but was rescheduled after passing safety tests and other required evaluations ahead of schedule. SpaceX’s resupply missions often face delays, so it is possible the printer will launch later than August. Made In Space formed in 2010 and developed the first version of a printer for NASA in 2012. The Mountain View-based startup has tested the machine on parabolic flights, where brief episodes of near-weightlessness mimic the microgravity aboard the ISS.